Mo Diames three year contract is up next June, and with it being so late we wondered if Rafa would give him a new deal. He disappointed in the Championship after we got him from Hull for just £4.5M and he disappointed in the first half of last season too. But this year he has been a stalwart in midfield alongside Jonjo Shelvey and played some great games for us last season in helping Newcastle finish in 10th place. Newcastle have just announced a new six-year contract for captain Jamaal Lascelles. And the Chronicle are reporting that Mo already has an agreement with Newcastle on a new deal and that could be made official later this season. It depends on him playing a stated number of games before the new contract is triggered. He has so far missed only one cup game this season starting all 11 games in the league. 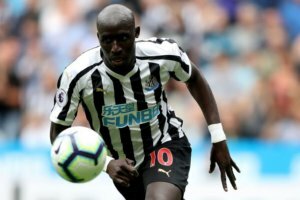 Diame turned 31 in June but gave up International football for Senegal 18 months ago to concentrate on his Newcastle club career. Diame made 35 appearances last season and 41 in the Championship, and he’s played 85 games in total with 8 goals and 5 assists. Rafa is making him fight for his place this season if he is to get an extension next summer – probably for a couple of years. He needs to continue the form he has shown this year, and he should get that new deal. Thought Diame had a great second half. He’s the only one that breaks up the opposition play. hopefully gets back to his second half of last season’s form. The nowhere men a book mentioned is also a very good read. Grahame Carr is mentioned briefly in it and he was well thought of and envied for his long contract by other scouts. Think he needs to show more consistency. When he’s playing well it reflects on Shelvey as it allows him to do what he does best and open up defences. Hopefully the win will give the whole team confidence to take it up a notch.